Many people say that baby changing tables aren’t necessary because mothers can use virtually any flat surface to change their child’s diapers. Many parents even change diapers on the floor where there’s zero risk of their child falling. But I strongly disagree with this practice because changing tables are beneficial for both mother and baby and I will tell you why. With a changing table, you have a strong and sturdy platform on which your baby will feel secure while you’re changing their diaper. You will neither be reaching up nor stooping down just to make short work of it. You also have a place where your baby’s diaper-changing supplies can be organized within easy reach. 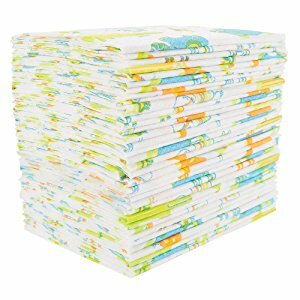 Here are six of my top picks for changing tables as well as my recommended pads. These are guaranteed to provide parents with a sturdy platform and plenty of storage. 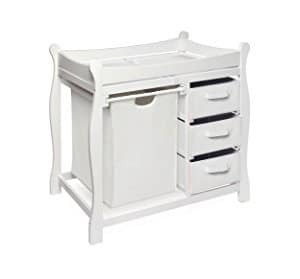 This changing table is available in four different finishes – black, white, espresso cherry, and black cherry espresso, so there’s a color that will match any nursery’s theme. The table’s height cannot be adjusted, but it’s sufficient for most average-sized people. The top features four high sides so your baby stays on the table, but the rails are low enough to allow for comfortable hand movements when changing nappies. The water-resistant changing pad provides a comfortable surface for your baby to lie on. The safety strap minimizes the table’s movements during the nappy changing process. The table should ideally be placed flush against a wall and on a level surface so stability is assured. The two open shelves are spacious enough for storage of various baby supplies, such as lotion, diaper ointment, and diapers. Since there are no doors to deal with, getting these supplies are easy. These can also be outfitted with open baskets to keep the supplies well organized, as well as stop them from falling off the shelves. The wood has a sturdy quality to it without a hollow sound. When it becomes a bit faded, it can be repainted in the same or different color. It may also be repurposed as a dresser for your child’s bedroom or a toy display shelf. What's Great About It: The table has a nice design that fits in well with modern nurseries. It’s strong and sturdy enough to cope with the thousands of nappy changes over the years. There is assembly involved, but it can be done by a single individual in just minutes. 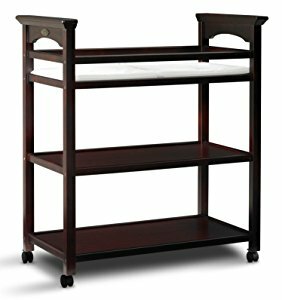 This changing table has safety rails on all four sides to keep your baby secure, as if in a shallow crib. But with the rails measuring just 5½ inches in height, this table practices standard safety measures. Even if your baby can’t roll on his side yet, it’s best to still keep a hand on him while changing their diaper. The 1-inch changing pad is sufficient for keeping your baby’s back comfortable during the diaper changing process. But many moms also say that they changed the original pad for something thicker or placed another pad underneath it. The popular option was the Babies R Us disposable changing pads. 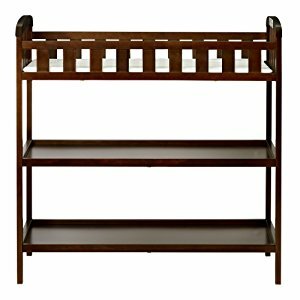 Below the changing table itself are two open shelves where your baby’s supplies can be stored. These are near the changing table’s surface so it’s easy to reach down for the needed supplies, whether it’s a diaper or a shirt. The supplies can also be placed inside open storage baskets for better organization. What's Great About It: The table’s height is perfect for maintaining a comfortable body posture. The risks of back aches and leg cramps from stooping too low are reduced when using this table. This changing table comes highly recommended because of its use of sustainable New Zealand pine wood. It also doesn’t have harmful chemicals like lead and phthalate. Even the finish has a non-toxic quality that all parents want in their baby’s furniture. With its 3o-pound maximum capacity, it can be used well after your baby’s first year for other purposes. This table can be a piece of furniture in your child’s bedroom or in the family kitchen. The changing tray is also removable, a feature that extends its life. 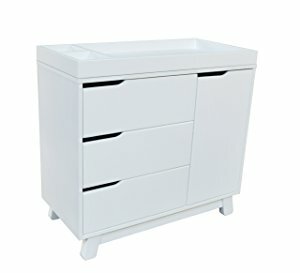 This piece of furniture has three uses – a changing table, a dresser with three drawers, and a storage cabinet. The compact design coupled with the multiple uses make it suitable for nurseries in apartments and condos. The drawers and cabinet hold plenty of baby supplies too, so all diaper-changing items are within easy reach. The raised sides are high enough to keep your baby on the changing surface, but low enough that you can change a nappy quickly. The anti-tip kit, which should be placed flush against the wall, reduces the risk of the table tipping over. What's Great About It: The stop mechanism on the drawers prevents them from opening all the way. The drawer will not present a stumbling block for adults and a safety hazard for children since it can only be partly opened. Made of solid pine wood, the Graco Lauren changing table can withstand years of use as a changing table and as a repurposed piece of furniture later on. Many parents say that they were able to use it for all of their children. The adjustable safety strap should be anchored to the wall to prevent the table from tipping over. The table itself should be placed against a wall, out of direct sunlight, and on the flat floor. The 1-inch thick vinyl changing pad minimizes the spread of stray pee and poop. Just wipe it with a clean cloth and disinfect after each use. In case of too much dirt, just wash it with mild soap and water before air-drying it. There’s plenty of storage for the baby’s supplies in the shelves. 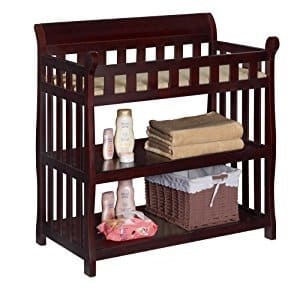 The shelves’ dimensions allow for storing large and small items, such as baby clothes, cloth and disposable diapers, and powder. What's Great About It: The wheels make it so easy to move it from the nursery to the bathroom and vice versa. These should be locked when it’s being used to ensure your baby’s safety. It also meets the safety standards implemented by ASTM, CPSC, and JPMA, and it comes with a 1-year warranty. This is a changing table that is as easy to use as it is easy to clean. After using, just remove the changing pad and wipe the table’s affected surfaces with a mild soap-and-water mixture and a clean rag. Place a disposable pad on top of the vinyl pad for the next diaper change. There are two types of materials used for the table. The top, drawers and shelves are made from sturdy hardwood and wood composite material. The changing surface – or top – has a metal support bar underneath it, which adds to its stability while in use. Aside from the usual pull-out baskets – the Badger table has three of them – there’s also a laundry hamper. Your baby’s dirty laundry can then be tossed into the hamper while their clean supplies are in the baskets. What's Great About It: The elegant design makes it suitable for repurposing after it has outlived its primary use. But as a changing table, it has the right number of storage spaces and the right height for most parents. Even with the best changing table, disposable changing pads will still be necessary. The original vinyl changing pad’s pristine appearance will be stained over time. Placing a disposable pad on top of it maintains its cleanliness and hygiene. With Babies R Us disposable pads, the dirty diaper can just be wrapped up in it before disposal in the trash. No clean-up, no messy vinyl pad, and no hassle. These disposable pads can also be used outside of the home, such as on changing tables in public restrooms. What's Great About It: These disposable pads are an affordable option to placing linens on the vinyl pad. Here’s what I believe makes a changing table superior over others – or better yet, the right choice for you and your baby. First, check the durability of the materials and the table’s overall construction. Solid hardwood and wood composites are excellent materials, but these should also be constructed in a way that ensures stability and strength while in use. More in Baby Accessories: What are the Best Baby Wipe Warmers? Second, look at the safety strap and its functionality. The pad should be anchored securely to the table using the strap so that there’s no slipping and sliding while your baby’s on it. Third, check the height of the rails. These should also be of sufficient height so your baby stays inside the surface, while still providing enough room for your hand movements. Fourth, consider the number of storage options. The drawers and shelves should be arranged in a way that’s convenient for the parents, especially in terms of placing what items where. These can either be open or closed depending on individual preferences, although open shelves are more convenient and safe. Fifth, ensure that the table height reduces the risk of back pain from bending over your baby while changing their nappy. Parents should check the height while in the store or read the manufacturer’s descriptions. Taller people can place an average-sized changing table on a platform to add more height. Savvy parents usually look over several changing tables before making their final choices. The time, energy and effort poured into choosing one is well worth it in terms of the baby’s safety and the parents’ back health. Changing tables are pieces of furniture that must be used in a responsible manner by parents and caregivers. Did you know that an estimated 3,000 babies suffer from injuries related to changing table accidents, with some of them being fatal? An accident can happen in the time it takes an active baby to roll over and fall to the ground, which is akin to an adult falling down several stories. For this reason, the following safety measures are a must to keep your baby safe and sound while they are on a changing table. Prepare all the supplies that your baby will need for his diaper-changing time. Keep these supplies within easy reach so that you don’t have to reach awkwardly, causing your to remove your eyes and hands off your little one. Always keep an eye and a hand on your baby when they’re on the changing table. You cannot take the risk of them rolling over the safety rails and falling down to the floor. Carry your baby in your arms if you must reach for something that’s a few paces away. If there’s somebody at the door or somebody’s calling, pick up your baby and carry them instead of leaving them behind. Lock the wheels when your baby is on the changing table and you’re changing their dirty nappy. Never ever move the table while your baby is on it, even when he’s strapped to it. The wheels can malfunction, so there’s a risk of bumps and falls. The importance of a changing table and pads for your baby cannot be overemphasized. The sometimes messy task becomes more tolerable when there’s no hunching over your baby and no overreaching for supplies. But keep in mind that responsible use is a must too. Babies shouldn’t be left alone even for a few seconds on these tables, just as in the case of bathtubs. These aren’t bassinets and cribs, after all. Further Reading: What are Some of the Best Diaper Pails?